Royal William Yard looking towards the east gallery. RWY - works in the east gallery. Royal William Yard looking towards the west gallery. RWY - works in the west gallery. Lectures held on Thurs 14 June. In recent years, growing recognition from a national audience, with increasing international interest in Europe and America, has established Lenkiewicz as a serious and increasingly relevant 20th century British painter. Sponsored by The Somerville Gallery, the exhibition will take advantage of two vacant units in the Mills Bakery building at Plymouth’s historic Royal William Yard, which is pioneering the Stonehouse and Millbay regeneration project with cultural events, and where visitors will also find a selection of thriving restaurants and cafes. 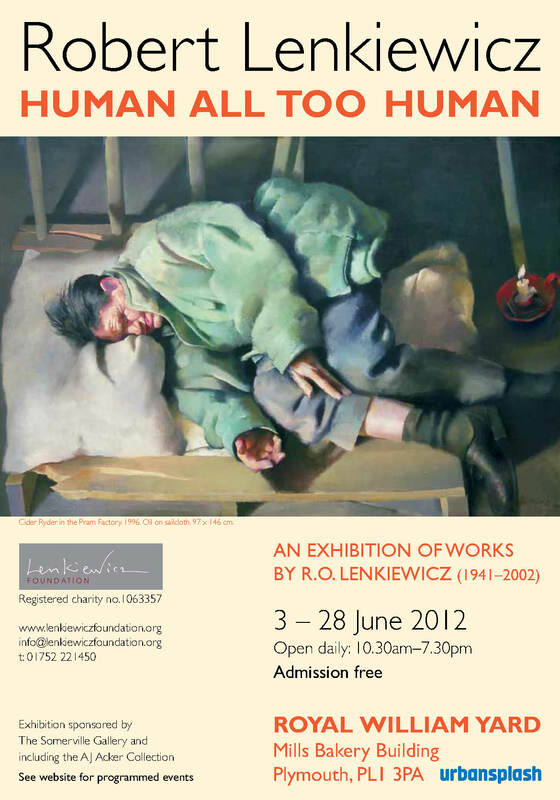 The exhibition will run from 3rd June at The Royal William Yard (Mills Bakery Building) and will continue until 28th June 2012. Open daily 10.30 am to 7.30pm. A series of programmed events will accompany the show, with an introduction to the exhibition, lectures, guided tours and artists’ talks already scheduled. Dates and times will soon be available on the website and promotional posters. A talk and painting demonstration by artist Louise Courtnell: 'A tonal approach to painting'. An opportunity to observe Lenkiewicz's tonal method of painting demonstrated and explained by one of his most accomplished former pupils. 25.5 x 15 cm. Pencil. 165 x 115cm. Oil on canvas. 119 x 82 cm. Oil on canvas. 122 cm diameter. Oil on board. 31 x 55 cm. Oil on board/mirror. 61 x 50 cm. Oil on canvas. 45 x 36 cm. Oil on board. Charcoal, pencil and black ink. 16 x 8 ins. Aesthetic Note. Cryla on paper. 3.5 x 6 ins/3.5 x 6 ins. Drawing. Rose thorn, ink and pencil. 13 x 10 ins. Drawing of a vagrant with associated notes. Pencil and ink. 16 x 12 ins. Aesthetic Note. Mixed media. 15 x 21 ins. Aesthetic Note. Mixed media. 16 x 16 ins. Aesthetic Note. Mixed media. 13 x 23 ins. Watercolour heightened with white. 13 x 12 ins. Aesthetic Note. Watercolour, pen and ink, heightened with white. 16 x 12 ins. Aesthetic Note. Mixed media. 13.5 x 14/6.5 x 13 ins. Aesthetic Note. Watercolour, pen ink and bodycolour. 11 x 8 ins. Aesthetic Notes. Mixed media. 11 x 8/11 x 8 ins. Aesthetic Note. Watercolour and bodycolour on paper. 16 x 20 ins. Aesthetic Note. Pen, ink and watercolour. 20 x 16.5 ins. Aesthetic Note. Watercolour, pen, ink and bodycolour. 18 x 17.5 ins. Aesthetic Note. Watercolour and bodycolour. 16 x 11 ins. Aesthetic Note. Watercolour, Pen and ink. 8 x 11.5 ins. Aesthetic Note. Mixed media. 11 x 9 ins. Aesthetic Note. Cryla on paper. 13 x 7 ins. Aesthetic Notes. Pen, ink and watercolour. 9.5 x 6.5/9.5 x 6.5 ins. Aesthetic Note. Pen, ink and watercolour. 11.5 x 15 ins. Aesthetic Note. Pen and ink. 11 x 8 ins. Aesthetic Note. Pen, ink and watercolour. 16 x 11 ins. Aesthetic Note. Watercolour, pen, ink and bodycolour. 11 x 8 ins. Aesthetic Note. Pen, ink and watercolour heightened with white. 10.5 x 9.5 ins. The Painter with Benedikte. Syd sniffing glue. The Father Eats His Son. The Painter Holding Himself When Ninety. Study of the Painter’s Dead Mother. Mary Flayed, Marsyas. The Painter With Mary in Newspaper Magi... Suicide. Aesthetic Note. 31 March 1978 - '... Painter, Amelie and Cat. Aesthetic Note. 31 March 1978 -... Go away! Nearer! Physiology (Lover With Four Memories). Man Watching Woman Walk Away. Self-Portrait with lover. Barbara Bridgeman and Caroline Young. Mr Fisher (Bishop) with bottle of... Bishop Startled. The Father Eats His Son. Physiology (Lover With Four Memories).